Although my childhood seems like a lifetime ago, there are many things that stand out and make me think that I once lived a very dangerous lifestyle. We played in the mud and made mud pies. We drank water from a garden hose and we ran from cottage to cottage in our bare feet, jumping through puddles and springs on the way. We picked up worms, bugs, frogs and chipmunks – in our hands! There were nights that my parents had to physically drag me inside because I couldn’t get enough of the outdoors. We swam under our dock and hung out with the rock bass and the dock spiders. We had cook-outs and ate the fish we caught that day and we showered in the rain on the days that the water poured from the sky. In the winter, we made forts in the snow banks and we stood outside in -20 degree temperatures to wait for the school bus which felt just as cold inside as it was outside. The reason for my stroll down memory lane is a strange tale. Let me set the stage. It was late afternoon. A slight rain was falling and I had run to the grocery store for an item that I had overlooked on my list. I was wearing a light summer dress and the rain was gentle but steady. I picked up my item and, as I was leaving the store, a father and his three teenage children were standing in the doorway watching the rain. The oldest sibling told the others to put their coats on and the father instructed the kids to wait indoors while he retrieved the car and picked them up at the door. Not having children of my own, I was questioning whether the genetic make-up of children today is different from the children of my generation. Perhaps they melt now if they get wet? Maybe with all of the new allergies, rain now causes a reaction. Whatever the reason, I stood in the rain beside my car and watched as the gigantic SUV pulled up as close as it could to the door so the children could get into the car unharmed. I wonder if they are allowed outside at all in the winter? Me too, Jill. Imagine how different we would be. You post caught my eye so I felt compelled to read it. I am an advocate in my local community to get children and families into nature. Growing up off-grid in the late 70’s and early 80’s shaped my childhood quite a bit. 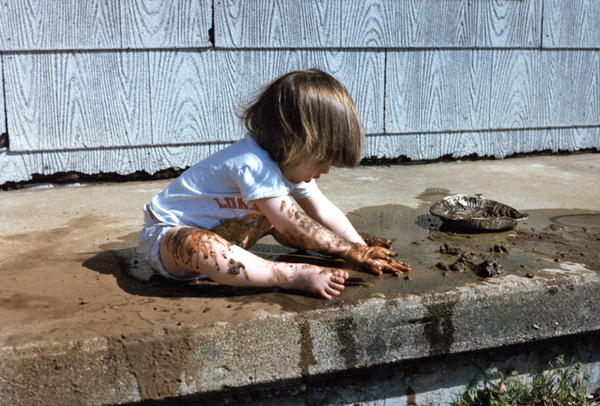 Now that I have children, I want them to experience the same love of mud, cool grass on bare feet, and exploring the woods that I had a child. You touch on a real fact of today’s childhood experiences – they are largely indoor and sensory deprived. Glad I found your post! Thank you for your comments. I was born in 1969 so you and I had very similar upbringings. I just can’t imagine who I would be now if I spent my childhood staring at a screen of some sort. Thanks for stopping by!